"URGE CALIFORNIA LAWMAKERS TO OPPOSE SB313"
Please oppose California SB 313, disguised behind the title “Circus Cruelty Prevention Act”. This bill would prohibit licensed and regulated wildlife outreach organizations from using wild or exotic animals, as described in the bill, from traveling to schools, libraries, assisted care facilities, fairs, parties, etc. to present their educational programs and would impose a civil penalty for each violation. The educators, exhibitors, and keepers who care for these animals provide a home for them and have made a commitment to provide the highest standard of care. These animals were bred in human care and therefore are not candidates for release or reintroduction to the wild - they serve as stewards for their wild counterparts by contributing to the advancement of conservation through education. SB 313 was introduced by Senator Ben Hueso on February 15, 2019 and will soon be scheduled for a hearing before California legislators. California SB 313 is an act to add Chapter 4.5 (commencing with Section 2430) to Division 3 of the Fish and Game Code relating to wild and exotic animals. SB 313 would criminalize organizations and owners who work in the business of wildlife education. The animals impacted under SB 313 (see list) are all heavily regulated already by both state and federal laws. The USDA enforces the federal Animal Welfare Act (AWA), which licenses animal exhibitors to ensure that all of an animal's needs are met under the purview of USDA/APHIS. These licensees are inspected on a regular basis, including unannounced inspections, while traveling OR receive regular audits at their home facilities to ensure compliance. The California Department of Fish and Wildlife also performs annual inspections to facilities that house wild or exotic animals and requires these animals to have a clean bill of health from a veterinarian plus a permit prior to entering the state. Though SB 313 is titled as a circus cruelty prevention bill, the truth is there are only THREE circuses that continue to travel to California that house animals, (one with camels, one with llamas and one with big cats), yet this bill would affect nearly 300 USDA/APHIS regulated or licensed California exhibitors. Private owners and facilities that take part in travel for exhibition and education are essential to the survival of endangered species. Studies have shown that working to educate the public about the plight of animals living in the little remaining wild creates empathy for those threatened species. Animal presentations and exhibitions provide people the opportunity to learn about fascinating creatures from around the world or even their own backyard up close and personally. Please send your letters to California legislators and urge them to OPPOSE this misguided legislation by clicking the "Send Message" button below. We ask that you personalize the letter, but feel free to use the template as a guide. 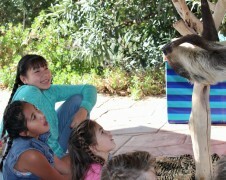 Thank you for helping to preserve wildlife education and outreach!